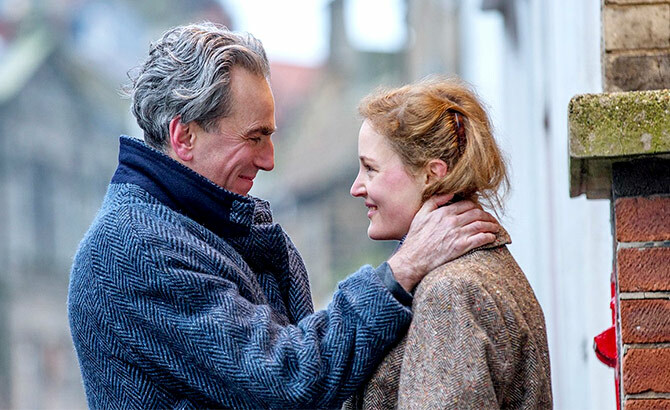 Phantom Thread is the most real, most riveting portrait of toxic love you’re likely to witness in a long, long time, feels Sukanya Verma. A simple action of Daniel Day-Lewis eating a buttery mushroom omelette conveys more ingenuity than many a capable actor can only hope of in their entire career. By virtue of Daniel Day-Lewis, nothing is simple. The action of him nibbling on an egg dish is accompanied with a stare and smile so discerning, it could only end in a confession and the most bewitching moment of Paul Thomas Anderson’s masterpiece, Phantom Thread. As the woman at the other end of his piercing gaze, Vicky Krieps, a remarkable talent from Luxembourg, matches Day-Lewis in wit and harmony with steely determination and gentle ambiguity. If not for the three-time Oscar winner’s decision to retire after this -- all the more reason to reconsider -- Krieps would be hogging all the limelight. Phantom Thread is largely her perspective. An attractive quietness confounds their strange relationship as well as the film, which allows its characters raging passions and perfectionism to be understood on its own without forcing confrontations or excitement. The upshot is a steadily suffocating ambiance, which begins like a seductive game of wits only to demand its players give into their darkest impulses whilst laying forth the most intriguing ideas on feminism and masochism. Day-Lewis plays Reynolds Woodcock, a valued couturier in post-war London modelled on Spanish dress designer Cristobal Balenciaga, who hates confrontations, distractions, strawberry jam and anything remotely jarring in sound or sight. His fastidious grooming routine, clinically operating workplace and impassive but devoted sister (the astute Lesley Manvilleevokes a gentler Bette Davis) reflect this discipline. But the entry of a waitress named Alma (Krieps) threatens to destroy his carefully achieved precision with convention and spontaneity. In the beginning, she’s a willing mannequin, happy to share emotional space with his dominant sister and dead mother, feeling empowered in his impeccable creations and a little less conscious of her imperfect frame. 'My job to give you some, if I chose to,' remarks Woodcock on noticing her lack of breasts. He’s equally taken in by the ingénue except what would be the look of love for any other filmmaker is an occasion for scrutiny in a PTA creation. Woodcock studies and judges Elma’s every move, every noise minutely, disapprovingly. Sensitivity can make a man cruel. 'Maybe you have no taste,’ he tells her. But Elma’s gumption is what gives her an edge over her ruthlessly discarded predecessors. 'Maybe I like my taste,’ she retorts. Feeling trapped inside his increasingly complex designs, she wishes to be more than a muse and model and reciprocated for her affection and asparagus in conventional terms, no matter how vulgar Woodcock deems it. What’s fascinating is how she alternates between submission and manipulation, questionable as it may be. Elma has come to understand the volatility of loving a fussy genius until Woodcock hands her the key to his soul and salvation. Unravelling in the splendid but stifling interiors of his grand abode, Phantom Thread barely ventures into fresh air for a break. But it’s the most real, most riveting portrait of toxic love you’re likely to witness in a long, long time.